A few weeks ago I was able to trace back a few copies of Hop!, a French comics magazine. In issue 25 of that magazine, dating from 1981, there’s a 4 page article written by Jean Marie Smits on the flemish production by Bob De Moor including a drawing which hasn’t been republished before. We got in touch with Smits to know something more on the background of this drawing, but he unfortunately couldn’t recall from where exactly the drawings originated. 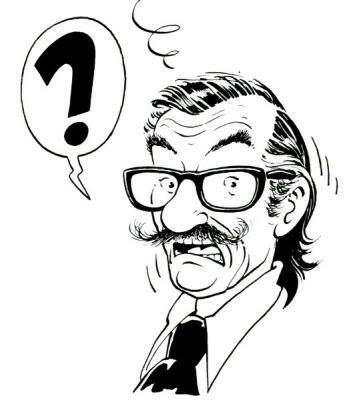 However he guessed it had probably been published in Ons Volkske which ran from 1932 until 1988. Next to Bob De Moor you can also find work from Gommaar Timmermans, Hurey, Gilbert Declercq, Gert Ronde, Karel Verschuere, Jo-El Azara, Tibet and many other Kuifje related collaborators. 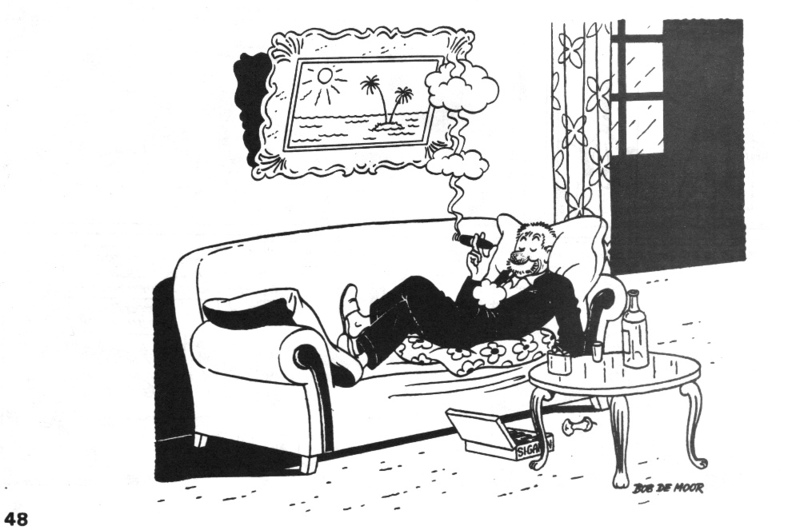 The drawing shows a moustached person resting in a sofa while enjoying a cigar and some liquor. You can recognise a steel pocket hip liquor flask on the table next to the bottle and a drinking glass. It’s our guess this drawing dates from the time De Moor was working on his first Barelli album. You can recognise the typical legs De Moor was drawing around that time (we’re speaking of the period 1949-1951). This 64 page issue is actually full of interesting material apart from the Bob De Moor link, to start with the cover drawing which is a Le Rallic one (there’s some Hergé elements in there if you look well). Le Rallic, full name Étienne Le Rallic (1891–1968), was a French illustrator and comics artist. The 5 page coverage based on an interview Jean-Claude Rochereau had with this artist is a must read if you are unaware of this talent. A bit further in this issue you also find the short story “La Cavalière du Texas” by Le Rallic. Hop! could rely on quite an international brigade of collaborators and not surprisingly we also find the Flemish comic connaisseur Danny de Laet back in that list.